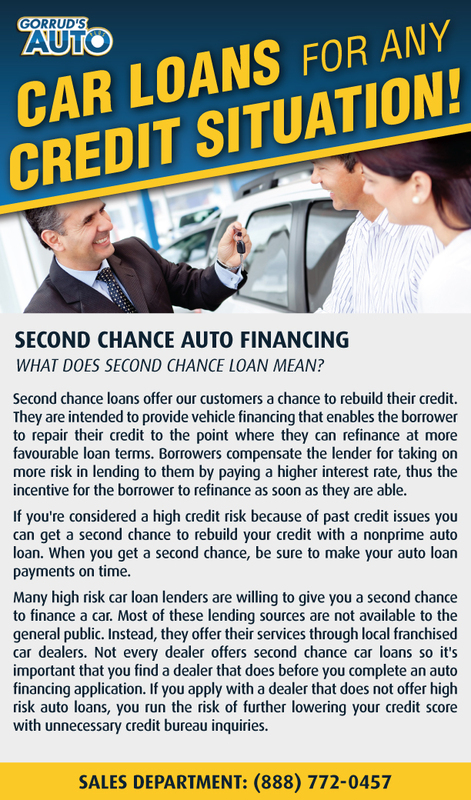 What does second chance loan mean? thus the incentive for the borrower to refinance as soon as they are able. If you're considered a high credit risk because of past credit issues you can get a second chance to rebuild your credit with a nonprime auto loan. When you get a second chance, be sure to make your auto loan payments on time. Many high risk car loan lenders are willing to give you a second chance to finance a car. Most of these lending sources are not available to the general public. Instead, they offer their services through local franchised car dealers. Not every dealer offers second chance car loans so it's important that you find a dealer that does before you complete an auto financing application. If you apply with a dealer that does not offer high risk auto loans, you run the risk of further lowering your credit score with unnecessary credit bureau inquiries.